A store reference and a personal favourite, these loudspeakers are transducers of electricity to sound in its purest form.This week we are running the ultimate Ambience Reference multichannel audio system with an Arcam AV8/P7 pre power hooked up to Ref 1800s at the front, Ref 1600s at the rear and matching centre set up in the Gambling Den demo area upstairs at 164 Lygon St. The Reference models are the Neodymium magnet high efficiency models at the top the range. Not cheap but highly effective! Ambience speakers use microscopically thin aluminium ribbons that are suspended in a magnetic field to reproduce music with none of the colourations associated with boxes and coils.They are an international success that are made in Orbost by an Australian engineer and we are pleased to have been associated with them since their inception in the early 90’s. If you only want to buy one more pair of speakers in your lifetime you must come and audition these. Ideal for music and high end surround, the basic Ambience 1400 starts at $3500 and goes up $10200 for the Reference 1800s.The top of the range Reference series are shockingly efficient - a 95db ribbon is previously unheard of in this product category. It means that they have both ridiculous dynmaics and room fill along with the absolute subtlety of detail rendition and the seamless imaging and absolute transparencey...as you may gather I am extremely partial to the sound of these devices. 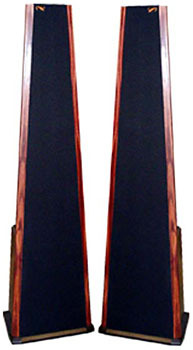 I believe the "Superslims" at about $5000 are some of the best value speakers on the Australian market.Follow our links to the manufacturers website for more in depth information on the range. It seems to me that Hi-Fi enthusiasts go through an "evolution of taste" in their speaker requirements. The first speaker that they buy as a misguided aspirational purchase is typically a floorstanding thin-walled device with lots of bass and treble and little subtlety.Brand names such as Accusound Welling Klipsch come to mind. After a bit of realisation they then might get into one of the more conservative bookshelf designs where the box itself is no longer such a factor of colouration in the sound, Such brands that we carry as Mission PMC and Dynaudio typify this product type. The way the almost micro thin ribbon hangs in space and produces the mid and treble frequencies is just a delightfully minimalist means of waveform propogation. The result for a properly embedded pair is that stereo ideal of a soundstage created in space independantly of the transducers.The music just hangs there in space and the image effortlessly spreads outside the extreme left and right of the speakers. The speakers have a dual mode of operation in that when they are operating in their direct mode at ear level they give that fabulous pin-point stereo stuff but when you are walking around the room they defy the inverse square law to give a space filling backgound effect that is a delight for socialisation and partying. There are always Ambience available at one of Carlton Audio Visual's lounges for demonstration. As ever we would encourage you to bring in some of your own software for a demo. You will find the spaciousness of their music portrayal without sacrifice of image precision to be quite unique.